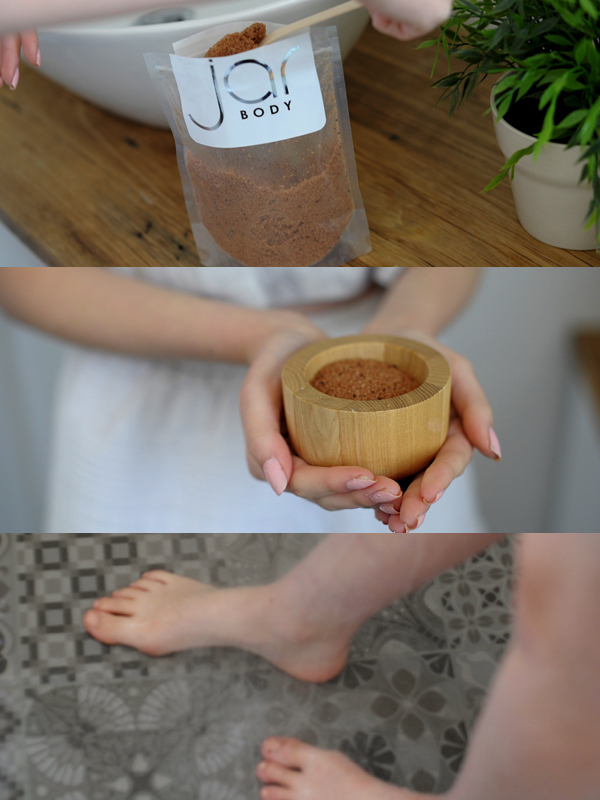 HOW TO: JAR BODY SCRUB – A DRY SCRUBBING RITUAL – VEGAN. NATURAL. CRUELTY FREE. DRY scrubbing has been a very popular form of exfoliation for centuries.. The scrubbing motion removes dry & old skin, so that new skin can re grow efficiently, resulting in a very healthy glow and complexion. We recommend you scrub with JAR 1-3 times a week and you will notice a vast improvement within just a week! Our JAR scrubs are packed with natural ingredients that combine together to treat and moisturise your skin, leave it silky smooth to touch. Below is a step by step help guide to dry scrubbing. 1: You can buy your chosen JAR body scrub online at http://www.jarbody.com.au or at one of our many retailers Australia wide! 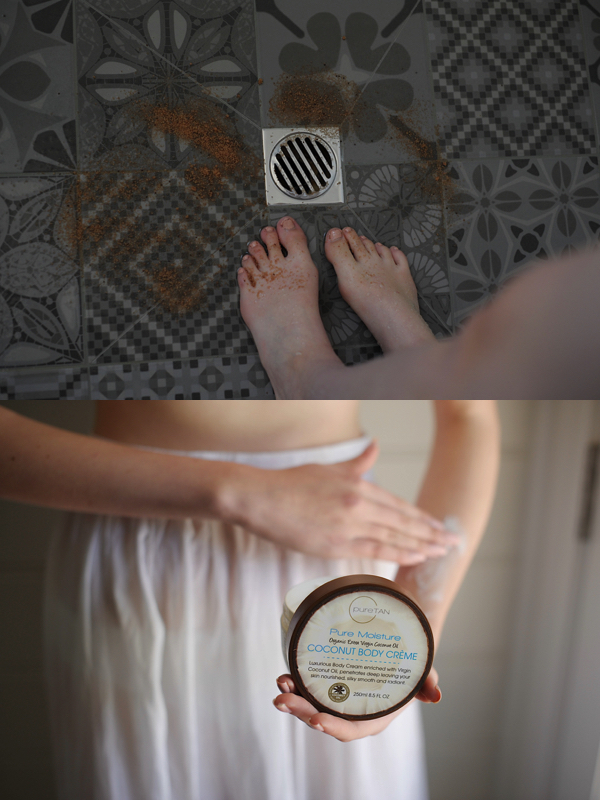 Our model ‘Summer’ is scrubbing with our CUBA body scrub – cacao, chia & coconut oil. With a delicate natural scent and ideal for pregnancy – this scrub is super popular for those with skin conditions such as eczema & psoriasis. Step 2: It is always best to plan ahead. 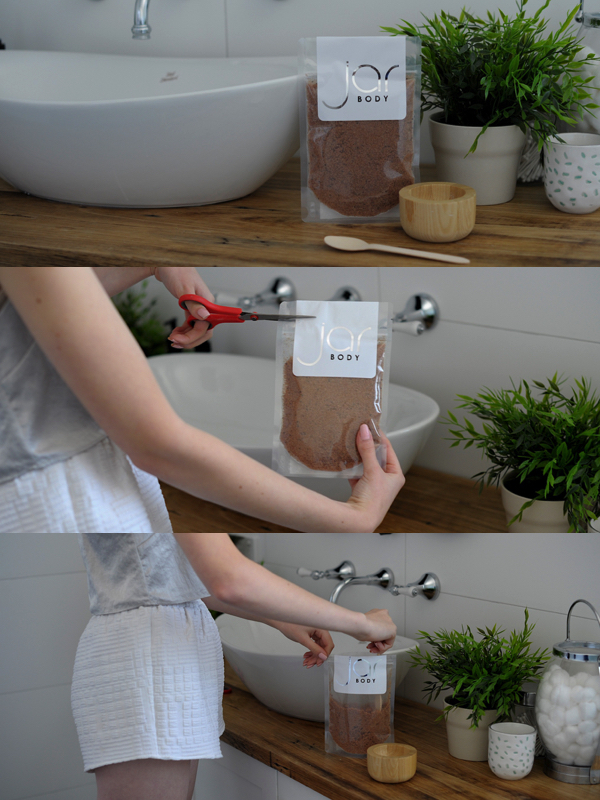 While you are dry and out of the shower or bath, Open your JAR pack, use the scoop provided to spoon out a few scoops of scrub into a dish or bowl. We have used a wooden bowl, so it won’t smash if dropped. Step 3: You don’t need a lot of JAR – as a little goes a long way and will get you the results you desire. Wet your body and turn the shower off, take a small amount of scrub and pat between your hands. Start on your arms, then torso – even re use the scrub on your arms and spread to your chest after you are done. Scrub in circular motions, evenly over all of your skin. You can ask for help with your back area. You may need to add a small amount of water to spread around more, it is up to you. Pay extra attention to dry areas like elbows, knees & feet. ALERT! During shower scrubbing, If you have scrub on your floor you are using TOO MUCH!! Like I said, a little JAR goes a long way. Above is ideal and below is an example of TOO much scrub being used! !